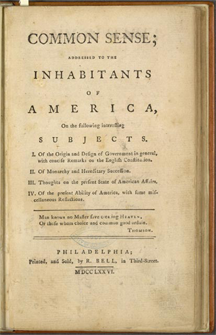 The first page of Thomas Paine's pamphlet "Common Sense," which appeared in 1776. In the first three months of publication, it sold 120,000 copies, which is impressive when one considers that the entire population of the Colonies at the time was under 3 million, many of whom were illiterate. That's one copy for every 25 inhabitants. Common Sense became the best-selling printed work by a single author in American history up to that time, illustrating the power of the written word. Your internal newsletter isn't likely to achieve such broad social impact, but it can nevertheless exhibit the power of the written word by keeping your stakeholders well informed about the issues and progress of efforts for which you're responsible. Photo courtesy WikiPedia. Whether you're responsible for a project, a department, a division, or a company, publishing an internal newsletter — by email, Web page, SharePoint, Facebook, whatever — can be an effective means of keeping stakeholders informed about what has happened, what is happening, what you believe will happen, and what you believe won't happen. A newsletter can become the authoritative source of information about the effort. Although it can establish you as someone who truly understands the importance of stakeholder relations, there is a risk. You don't want to flood readers with information they consider irrelevant to their special interests. Here are some tips for creating a newsletter that informs but does not overwhelm your stakeholders. If you don't keep stakeholders informed, you're leaving space for them to make stuff up. Publishing what you do know is far more effective than letting others make up what they don't know. Limit the length of each item to the length of a tweet — about 140 characters. Most people don't want to read long dissertations. Full explanations are unnecessary. Each item can be little more than a teaser to let the reader know what the impact is. Use the "So What?" test to develop a headline. See "Deliver the Headline First," Point Lookout for May 3, 2006, for more. Since some people do need more detail, you must provide it, but don't subject everyone to the full story. Write a more detailed explanation for your intranet site and link to it in the newsletter. Some people feel that denying rumors gives them wider circulation, but if you've heard the rumor, almost everyone else has, too, and thus wider circulation isn't really an issue. Squelch rumors, but be right about what you say. See "There Is No Rumor Mill," Point Lookout for March 26, 2003, for more. almost everyone else has, toobe doing something that you expect will be controversial, why wait for rumors to form? If you get there first with real information, you're less likely to have to deal with rumors. Short features describing the talents and contributions of key people are interesting to your stakeholders for the same reasons that features are interesting to news consumers in the media generally. Give the enterprise the information they need to gain a true appreciation of the efforts of the people you feature. Use your newsletter to introduce people who are new to the effort. Tell your stakeholders about their background and about the contributions you anticipate. Would you like to see your comments posted here? rbrenXTacTuHbUpjaqTqWner@ChacnSlcYxvyBkzexscyoCanyon.comSend me your comments by email, or by Web form. See also Effective Communication at Work and Project Management for more related articles. I offer email and telephone coaching at both corporate and individual rates. Contact Rick for details at rbrenFrZmvGvqfvjnkqywner@ChacstGcXbuhfyVpymStoCanyon.com or (650) 787-6475, or toll-free in the continental US at (866) 378-5470.